Graffiti has long provided a platform for street artists to criticize anything and everything the mainstream media does not, and perhaps cannot. The Zachem movement in Russia was founded almost two decades ago with exactly this in mind. "I'm not a [Franz] Kafka, I can't sit and write at a desk. I want my message to be heard. That's why I draw outside," street artist ZOOM said. Капитал. Холст. Акрил. Capital. Acryl on canvas. Zachem (or 3A4eM, or Зачем, meaning ‘why’ or ‘what for’) was a graffiti crew which started in the early 2000s. It centered around sociopolitical commentary, asking the general public to question more about the world around them and to re-examine their own day to day lives. Men in Black Большой Староданиловский пер. "We were asking why people do what they do," one of the founders of the movement, who preferred to remain anonymous, told the Moscow Times. "You have a choice in everything you do: to do or not to do it," he added. In recent years, city authorities across Russia have received a surge in funding for street art, transforming it into a more widely-accepted, mainstream art form. Some feel this undermines the commentary to an extent, by casting doubt on the artists’ motives and turning their own question back on them. 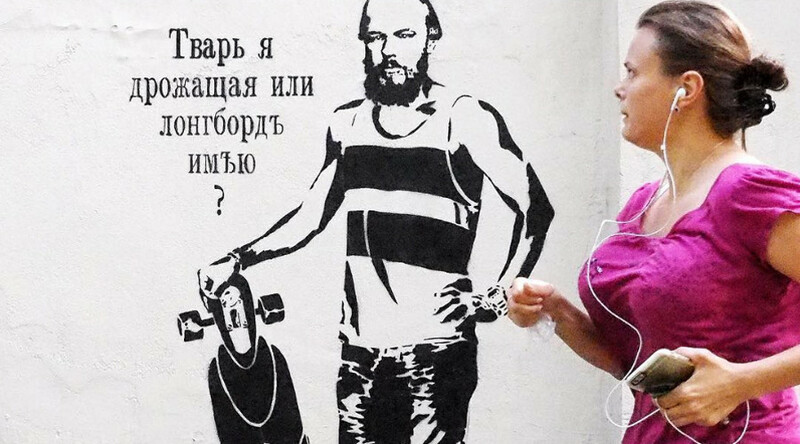 "One of the best ways of neutralizing the street art community is to put it into a reserve and control it from there...Just because it's painted on a wall doesn't make it graffiti," said Misha Most, one of the central figures of the contemporary Russian street art scene.